When my colleague at the animal shelter called me to meet a dog that had just been brought in, I couldn’t believe what I was looking at. It was about 10 years ago, and a man had come in saying he’d found three dogs and couldn’t keep them. I wondered if I was on Candid Camera: I’d worked at the shelter as a vet for 20 years, and had seen thousands of animals, but never anything like this. As he walked them towards the shelter, someone said, “He’s meant to be bringing three dogs, but that one’s a pig or something.” Quasi Modo, as I later named her, was around a year old and had a birth defect called short spine syndrome: everything fused together in her back and she couldn’t move her head. She still has to turn her whole body to look at anything. For the full story go to the Guardian. Click here to see photos from the annual Wiener race held in Bristol, Connecticut, helping to raise funds for the Connecticut Dachshund Rescue and Pet Services. Runners in a half marathon must have thought they had gone barking mad when an Alabama dog got ‘fur-ther’ than expected and finished in the top 10, a paw-some performance. Ludivine, a two-and-a-half-year-old hound dog, snuck out of her owner’s yard in Elkmont, Alabama, on 16 January and wandered to the starting area of the town’s inaugural half marathon, the Trackless Train Trek. Along with 165 runners, Ludivine then ran the half marathon, finishing in seventh place (unofficially speaking), despite wandering off during portions of the race to mingle with cheerleaders on the trail and to examine a rabbit’s carcass. Her owner, April Hamlin, did not realize Ludivine had even left the yard until friends who were volunteering at the race texted her photos of her dog. 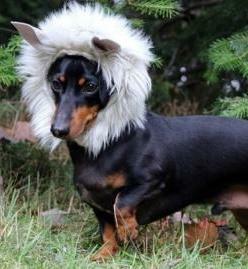 Click here for some fabulous dachshunds in costume. Westminster Dog of the Year competition includes a dachshund being aloof when walking with the pack.